This summer's most recent (and hopefully last) heat wave is finally over, and it feels wonderful to wear long sleeves again. Still tied my scarf as a belt though, over the past couple of months I just got so much into the habit of it! Such a classy and pretty combination with the contrasting lagoon Waterfall necklace. Typical MaiTai style! :-) ! It's getting hot here- 29 tomorrow. Looking so much forward to proper cooler weather too! The mornings and evenings have autumn in the air, but it still gets very hot during the day. Will pounce on the neutral APdE as soon as I see one! Gorgeous. Absolutely stunning in your understated elegant way. A latter day Grace Kelly. Thanks for sharing! This post is putting me in the mood for some tapenade! I've made your recipe several times - always yummy! So lovely to hear the recipe is a success. I've made it recently with less sardines but more capers, which is a nice variation. Enjoy a happy Sunday! Lovely look, and that's the way I prefer to wear my Poudre Clic bracelet--right next to my rectangular-shaped watch. Not a good look with the Rolex though. LOL You've made me reconsider navy and paler neutrals, and now the Lagoon with neutrals. It's not easy reeducating the brain when you're used to brights and black. Very true re the Rolex, I never wear a clic or clic clac next to it either. Have fun pondering colors, and a wonderful remaining weekend! So stylish, as always, my dear MaiTai! 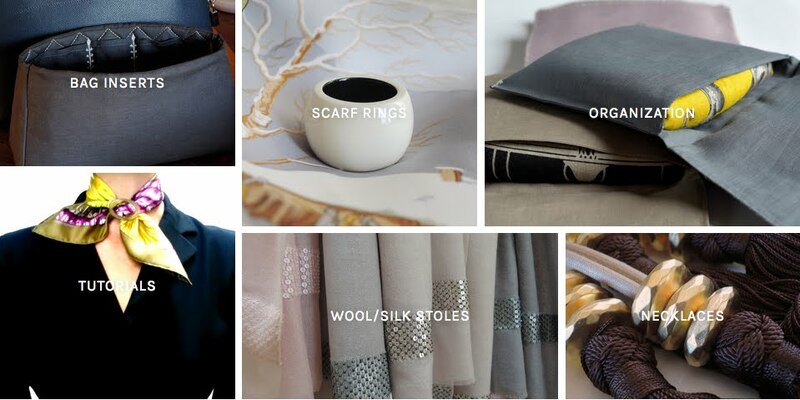 Very stylish and lovely neutrals. Olive trees hare have suffered in the last two winters and I had to cut them back quite hard, sad but essential. Hoping for a glorious Indian Summer! Hope your olive trees will recover, and that you have a milder winter ahead this year! Our harvest was wiped out last year, the dreaded olive fly ruined every single olive in the region. Fingers crossed for a beautiful Indian Summer to come! This is beautiful! I've always thought that Hermes scarves are to be paired with plain tops but obviously, one can get away with it with a slightly more understated printed blouse. What a coincidence. I was in Cornwall, not far from Padstow just recently. Cornwall is such a beautiful area. It was my first trip there and the entire family just fell in love with the place. BTW, I write a weekly series called Pass It Forward every Friday and I often feature 3 bloggers that I follow. Just to let you know that you're on this week's post. Hope you're well. Take care! 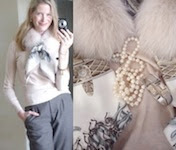 A belated, but heartfelt thank you for the lovely comment, and for featuring my blog on yours! How fun we had nearly crossed paths in Cornwall. It was DS's first trip too, and he absolutely adored it too. Enjoy a wonderful remaining late summer! 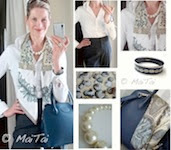 I adore your stunning scarf-as-belt look, and was inspired to try it. However, I had a hard time "tidying up" the loose ends of the scarf at the back without something "bulging" out. Would you please give me some tips on it? I'd greatly appreciate it! P.S. since my dear friend had introduced 'you' to me a few years back, many of my best friends have become a big fan of you (and H of course). Thank you for your inspiration!! Glad it helped, it's a perfect way to wear a scarf in hot humid weather. The collier knot is great too, the scarf barely touches the skin http://www.maitaispicturebook.com/2011/08/collier-knot-cool-knot-for-high.html Please say hi to the friend who introduced you in the first place, and thanks so much for spreading the word!